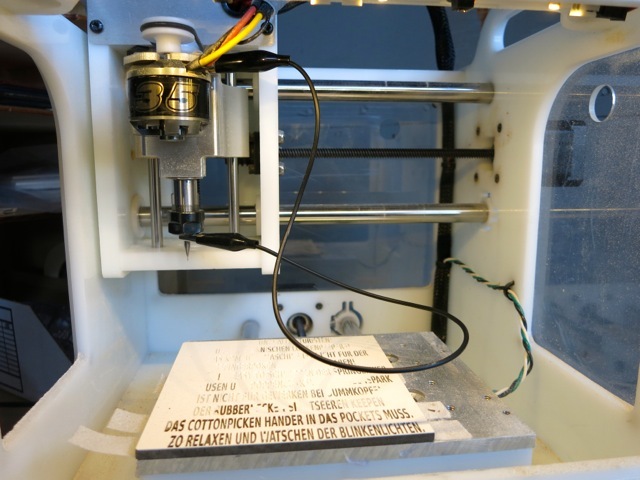 Are you experiencing trouble with your Bantam Tools™ Desktop PCB Milling Machine? Information about how to solve some common problems is below. If your question isn’t answered, please contact us at support@bantamtools.com for support. When I push the power button on the back to turn on the machine, nothing happens. Make sure the power cable is securely plugged into the side of the machine, the power brick, and a wall outlet. The power cord should click snugly into place in the back of the machine when it’s seated properly. The machine will turn on, but the “Start Milling” is greyed out! All Bantam Tools™ Desktop PCB Milling Machine come with the Emergency Stop button engaged. If you’re firing up your machine for the first time, look for the warning box in the software saying your E-Stop is on. If it is, push in and twist the red button on the side of the machine. Then make sure all four windows are placed on the milling machine. My spindle motor spins, but it sounds terrible. Your spindle motor likely has dust in it. Vacuum it out and/or clean it with compressed air. If it still sounds terrible after you’ve given it a thorough cleaning, contact us at support@bantamtools.com and we’ll help you troubleshoot. My machining bed is dirty. Clean it! Being careful not to scratch or damage the bed, use a scraping tool, like a putty knife, to pry larger chunks off the bed. Scotch-Brite pads are great for finishing. Acetone or specialty adhesive removers work great for removing stubborn hot glue and tape residue. Do not use steel wool, as the magnetic shavings will get into the motors and bearings. You can also run a facing plan in the software, which will machine down or “face” the bed with a 1/8" flat end mill. This will give you a nice shiny new finish after half an hour or so. Complete instructions for facing the bed can be found in our Facing The Spoilboard Guide. Rails are the metal rods in the milling machine. They can also be referred to as ways. Remove the rust by rubbing the rails with a Scotch-Brite pad or a similar material. Don’t oil your rails, as it will cause swarf to stick to them and could cause issues with how the metal rods interface with the linear bearings. Prevent the rails from getting rusty in the first place by always storing your milling machine in a cool, dry place, as humidity is what causes the rails to get rusty. I’m having trouble importing an EAGLE (.brd) file. Take a look at our EAGLE guide. I don’t use EAGLE as my PCB design software. That’s OK!the softwarecan import Gerber files from most PCB design software. See our Gerber Files Guide for further information. If you’re having a problem with your files, let us know at support@bantamtools.com. If the software crashes, let us know by sending a note to support@bantamtools.com! Please save the crash report that appears as a text file or copy it into the body of the email. Note when in the milling process the software crashed and what you were doing at the time. Also let us know how many times you have run the same file and if any other times were successful. We’ll find out what’s going on! The mill won’t mill some of my file. 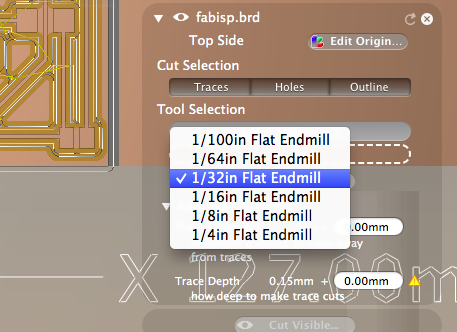 Sometimes the size of the tool you have selected or the width between elements on a circuit board will cause the software to let you know that particular areas of your board will not mill. Read the Unmillable Area Warnings guide for more information. My G-code calls for multiple tool changes in the same file, but for some reason it’s not working on the machine. Where ‘1’ represents the tool number. When that line is executed, the software will prompt you to change tools. My circuit board or other flat material came loose from the bed. How do I avoid that? Make sure you have a flat, even layer of tape across the whole back of the material. Make sure both the back of the material and the machining bed surface are clean and free of dust, swarf, or anything else that might reduce stickiness. Make sure the back of the material is flat and not curved. If your material is porous (like wood) or otherwise not sticking to the machining bed with tape, you can use a bead of hot glue around the edges of your material to keep it in place. My block of wood or other thick material came loose from the bed. How do I avoid that? Use a hot glue gun to place a bead of glue around the edges of your material. Use generously, but make sure that it doesn’t get in the way of the tool. Let the glue cool before milling. After your job is completed, use a soft putty knife to pry the glue from the bed. When I tried to locate my tool, it rammed into the bed. Make sure you’ve followed the tool-locating sequence appropriately. Was the tip of your tool too low? Make sure the tip of the tool is above of the bottom of the X-carriage before clicking the Locate button. How can I locate my tool if my material covers the whole bed? The button is greyed out! If you’ll only be using one tool for your project, just locate the tool before attaching your material. Once you locate the tool, set up your material in the software. If you’re using two or more tools, you’ll need to leave a small amount of space on the bed empty so the tool has a place to touch off. Sometimes when I use G-code, my machine freezes. Occasionally, some applications will generate G-code that doesn’t agree with the milling machine When that happens, feel free to send the file you were using to support@bantamtools.com, and we’ll take a look at it. Click File > Save Support Info, then Save Info in the window that appears. This will save your design files and job settings so that they can be reviewed by our support team. Zip up the folder where you saved the Support Info. Send us an email at support@bantamtools.com with the zip file from above and a description of the problem. Our friendly tech support team will be in touch shortly to help you solve the problem!